Jim Dillon, who spoke out against the Jade Helm 15 military exercise, keeps a couple of pistols in each car. 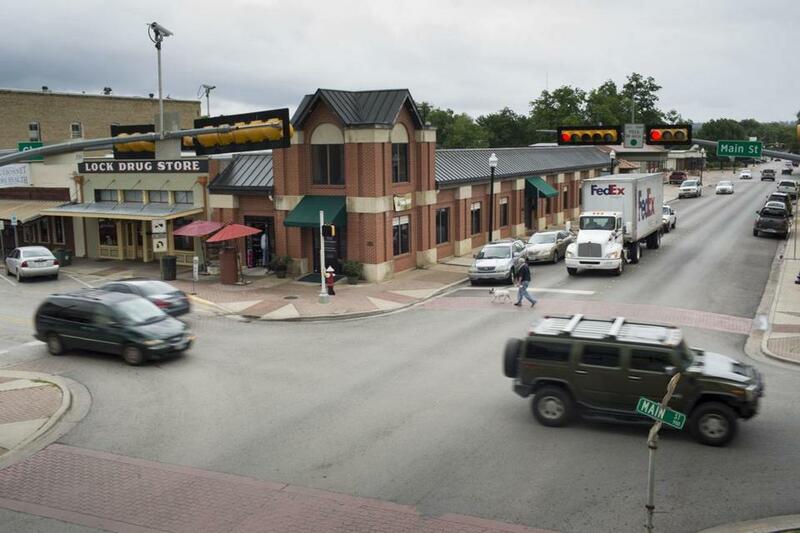 BASTROP, Texas — Texans in pickup trucks rolled in from hundreds of miles around on a Monday morning in late April, passing by water towers adorned with smiley faces that hover cheerfully over the county seat. They pulled up in the town center, near a catfish house called Paw-Paws and a barber shop offering old-fashioned shaves. As they filed by the dozens into the county courthouse, past a stone memorial dedicated to American veterans, it seemed from all outward appearances like a wholesome exercise in local democracy. But the citizenry was on edge. In a sign of the deep distrust that has emerged in conservative parts of the country, on this day in this town 30 miles east of Austin, anger and concern poured out about a large-scale US military training exercise to be conducted in Texas and throughout the Southwest. Rumors stoked on the Internet and conservative talk radio spread fears that the troops and Humvees that will roll through Bastrop this summer are part of a plot by the Obama administration to declare martial law in Texas. An Army officer in fatigues who flew in from Fort Bragg, N.C., in a bid to soothe nerves stood at the front of the overflowing meeting room and answered a barrage of questions — some of them seemingly bizarre. Could our culture be cultivating paranoia as it did with eating disorders? Read: Discuss: What's behind distrust? No, the military wouldn’t be seizing guns. No, the Walmarts closing down in certain communities are not being converted to detain and process political dissidents. No, the operation was not in preparation for World War III. “I didn’t believe a single thing he just said,” Dillon declared. The crowd applauded with gusto. Suspicion has built across many parts of America during the administration of President Obama, giving rise to the Tea Party movement and fueling an intense wave of anti-Washington resentment. But the spread of conspiracy theories appeared to reach a fantastical peak in Texas in recent weeks with assertions that the sweeping military operation called Jade Helm 15 is a takeover plot hatched in the nation’s capital by the White House and the Pentagon. 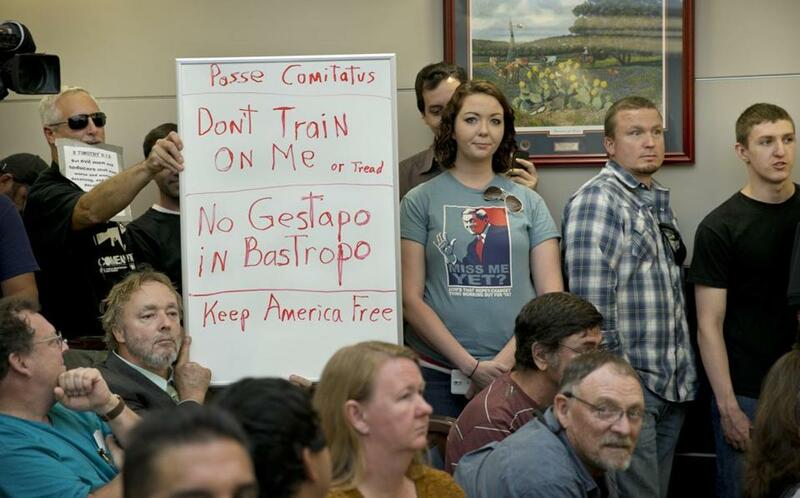 Bob Welch (standing at left) and Jim Dillon held a sign at a hearing about the Jade Helm 15 exercise in Bastrop on April 27. Paranoid ideas about the US government are not new in certain segments of the political spectrum. How did America become so divided, the state of the union so fractured, that the secretary of defense is forced to deny the Army is planning the hostile takeover of a state? Interviews with residents of this community illuminate the distrust that has developed across deeply conservative America — fueled by anger at the White House and Congress and a sense among many that the federal government is no longer on the side of the people it is dedicated to serve. The conflict about the Jade Helm exercise illustrates some of the most confounding political divisions in the country. It reveals how an increased willingness to believe in sinister plots, fomented by people once dismissed as occupying the political fringe, has seeped into the political mainstream of the nation’s second-largest state. Texas has more veterans than almost any other state. In Bastrop, some are members of a veterans honor guard and provide military funerals with full honors, complete with rifle squad and ”Taps.’’ It’s the kind of place where, when people walk the street in military uniforms, strangers stop to thank them. Restaurants serve them free meals. One of the largest military bases in the world, Ft. Hood, is about 100 miles north on state Highway 95. So last fall, when military officials approached the county about conducting a large-scale military exercise called Jade Helm 15, few local officials thought anything of it. The operation will take place in parts of seven states across the Southwest over two months, from July 15 to Sept. 15, and involve 1,200 Special Operations troops preparing to fight overseas. Because the exercise will mostly take place on private land in remote areas, the military says, local residents won’t notice anything aside from an increase in military vehicles on the roads and in the air. In January, top Bastrop County officials here held a public hearing and voted to welcome the military to town. There was little opposition at the time. Soon, Snowden, a Republican who served in an airborne unit, would learn that there was a strand of opposition in his community just waiting to stir. 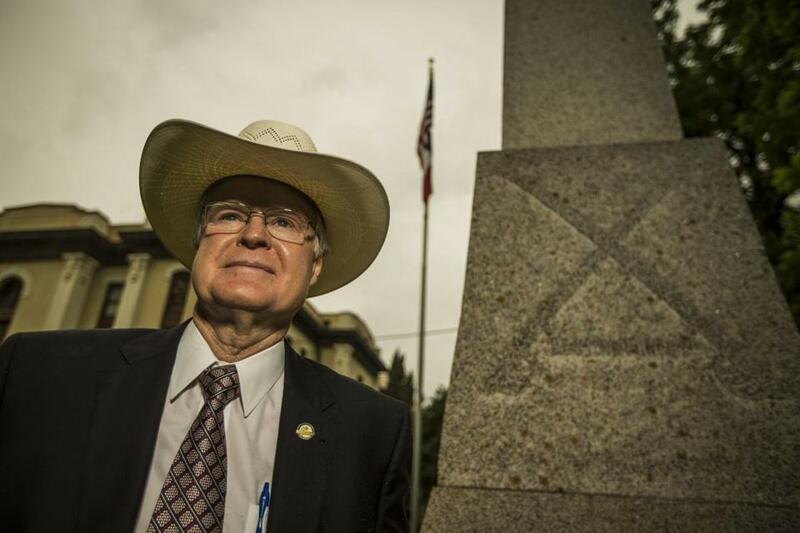 Judge Paul Pape stood outside the county courthouse on a recent day, wearing black cowboy boots, a wide hat, and a tie with the Texas state flag on it. Bastrop County Judge Paul Pape. On March 19, inside a studio in the state capital of Austin, talk radio host Alex Jones sat behind an anchor’s desk in a gray suit and open-collared shirt. Jones, 41, grew up in Texas, the son of a dentist and a homemaker. He got his start on public access television in Austin and now controls a media empire that includes websites, streaming TV, and a syndicated radio program. His show is streamed weekdays online, through smartphone apps, and is carried by more than 160 radio stations. 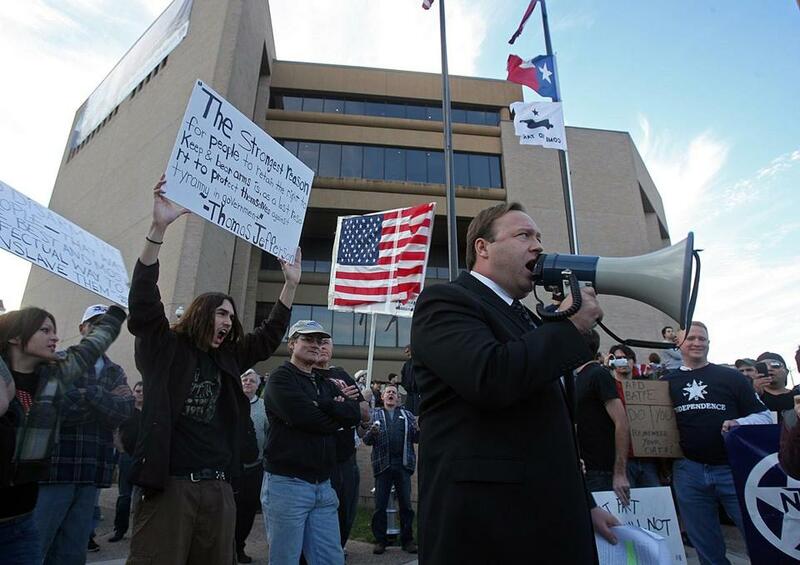 Talk radio host Alex Jones alerted his listeners in April to what he said was an invasion of Texas. His YouTube channel has more than 1 million subscribers, and his videos have been viewed nearly 510 million times. He has also produced more than 17 documentaries. And while Fox News commentators have been dismissing Jones as “a nut job,” some of the top politicians in Texas have echoed some, but not all, of his views, as they seize a political advantage from conservative paranoia about Obama. Jones initially agreed to an interview for this story but later declined after the Globe said it would not conduct the interview live on his radio show at his studio, which is tucked away in a nondescript brick office complex in Austin. 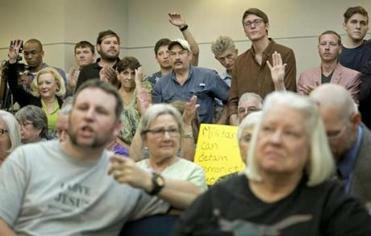 Not long after Jones began raising alarm bells about Jade Helm, officials in Bastrop began hearing from concerned residents. Phones began ringing in the county commissioners’ offices. Skeptical messages popped up on Facebook, and people began approaching community leaders at church gatherings. They were worried about the government coming to take their guns. There was a sense that President Obama would be willing to do anything to crush dissent. One of those who began to grow increasingly worried was Terry Wareham, a local Tea Party leader. Albert Ellison, the chairman of the Bastrop County Republican Party, said conservatives in the area already feel under attack from the Obama administration. It’s easy, he said, to believe the president would trample on their constitutional rights. 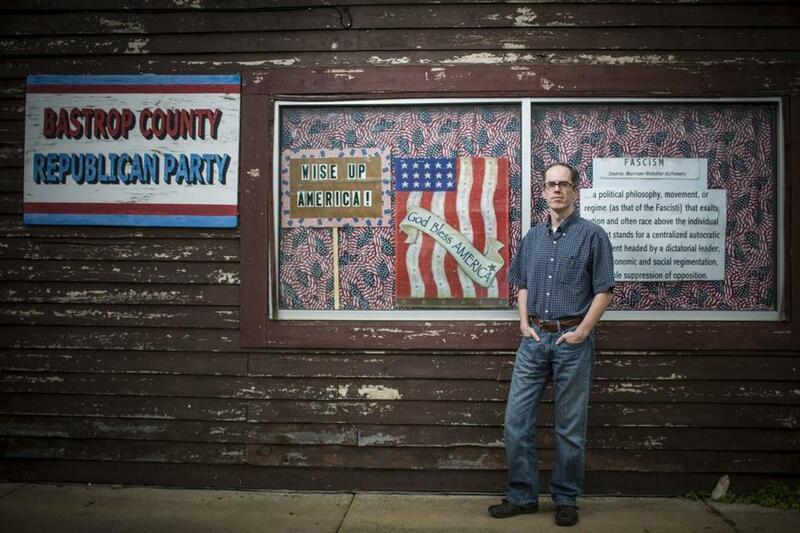 Bastrop County Republican chairman Albert L. Ellison in front of the county GOP headquarters in downtown Bastrop. With concerns rising, county officials decided they needed to call another meeting. Pape called military officials in Fort Bragg, the Army base in North Carolina helping to oversee the operation, and asked them to come and brief residents. Lastoria, the lieutenant colonel, answered questions for more than two hours at the community meeting. He sought to cast the operation as low-key, but the crowd was hostile, peppering him with concerns. “Why is it not reasonable for me to see this as absolute training for a domestic rendition program?” one man asked. “This is a one-sided conversation!” another man shouted. Related: Vote all you want. The secret government won’t change. Jim Dillon has soft eyes, a light stubble, and a lilting accent with a bit of a Southern drawl that gives him an outwardly gentle demeanor. But when Lastoria came to Bastrop to explain the military operation, Dillon said he couldn’t help calling the man a liar. During a series of interviews at a bookstore (where he held a book called “Conspiracy Theory in America” under his arm), at a gun shop (where he browsed pistols as a store clerk chomped on beef jerky), and at his house (where he demonstrated his marksmanship by firing a pistol in his backyard), Dillon explained his deep sense of suspicion. If Texas allows this military training exercise, in his view, there will be more. People will grow accustomed to seeing military officers on average American streets. And at some point, it will no longer be an exercise. It will become a way of life. Like a frog that gets used to the hot water only to later realize it was boiling, he believes, the public needs to act now, before it’s too late. He has tried to make his home as self-sufficient as possible. He has a propane tank, and he utilizes well water. He has more than a dozen goats and an expansive garden tended by him, his wife, and two daughters. He keeps a couple of pistols in each car and has a safe in his home with a collection of shotguns. During a Globe reporter’s visit, an AK-47 assault rifle rested on a table near the front door. Even while Dillon and others are wary of all politicians — Democrats and Republicans — their views have been given legitimacy in the highest echelons of Texas political leadership, including the governor. The day after the public hearing in Bastrop, Abbott — who was the state’s longest-serving attorney general before being elected governor in 2014 — requested that the Texas State Guard monitor the federal military operation. Abbott has declined several requests for an interview over the past several weeks. After his initial remarks got widespread media attention, he emphasized that Texans support the US military while laying the blame for popular concern on Obama. Longtime observers of state politics were only slightly surprised by Abbott’s decision. Henson’s department did polling of Texans in February, which showed the federal government was the least trusted institution. But it also showed that the military was the most trusted. Given the popularity of the military, Henson said, the governor could have chosen to back them more whole-heartedly. It’s about noon on a recent rainy weekday. Jones is finishing up the first of three hours on the radio, hammering away against Jade Helm. Rush Limbaugh can be heard criticizing Hillary Clinton on three different AM stations, coming up nearly one out of every five turns of the dial. Outside the American Legion post in Bastrop, a howitzer and an old Air Force plane are hulking reminders of the town’s military ties. Inside, AC/DC blares over the speakers as about a half-dozen local veterans drink bottles of Budweiser and munch on Cheetos. Cigarette smoke fills the room of dart boards, video games, and pool tables. Some are veterans themselves; others are friends or relatives of a veteran. Most are supportive of the Jade Helm operation and are baffled that anyone would think otherwise. “If it wasn’t for these guys, we’d all be in danger,” said Robert Friedel, a 43-year-old artist from nearby Smithville. “People have better be damn glad the military — if they didn’t have this place to train, what would happen?” added John C. Calhoun, a 90-year-old World War II veteran wearing a camouflage hat, overalls, and flannel shirt (and saying he was named after the 19th-century politician). But sitting a few feet away, James Kellam could not disagree more. Sure, his father was in the military for more than three decades and is now buried in Arlington National Cemetery. Sure, he grew up on military bases in the United States, France, and Germany. And yes, every Memorial Day, he puts flags on the graves of soldiers. But these days, the 63-year-old retired teacher says he is scared of his government. But how can he, even as he wore an American Legion T-shirt that said “We will not forget the sacrifice,” harbor such deep distrust of the military? He is not unfamiliar with the good that government can do. Nearly four years ago, when Texas wildfires swept through this area, his home burned down (the only things he saved, he said, were his guns, his son, and his dog). The Federal Emergency Management Agency wrote him a check for $30,200 to help him rebuild and gave him a trailer to live in while he got back on his feet. But after FEMA forced him to leave the trailer after 11 months, he was infuriated. He said he’s seen the good and the bad from FEMA. But he doesn’t doubt that the agency could build camps to house dissidents, if it came to that. As for him, he said he has his guns and ammo. 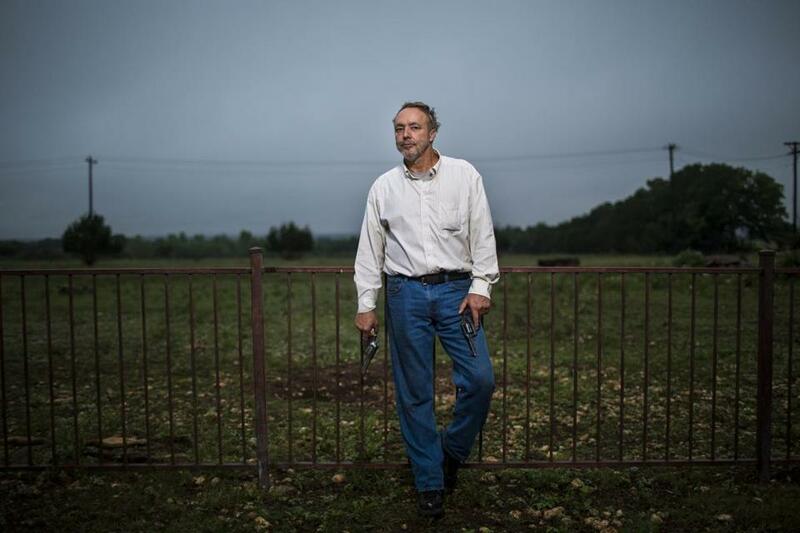 He carries a 40-caliber gun in the truck he drives while listening to Glenn Beck and Limbaugh. • Vote all you want. The secret government won’t change.